Wow, what a Thanksgiving feast we had. A house full of family and friends, warm hearts, lots of smiles and very happy children. The food…stellar, as several women from the same family came together to make a feast for twenty-something people, one I will not soon forget. I was in charge of dessert, I made five different kinds. These cupcakes were one of them. When I saw Ina make them on television, I knew I had to have them. They have rum soaked golden raisins and crystallized ginger mixed right into the batter….to die for. The orange flavor plays perfectly with the gingerbread which I didn’t expect. These are the perfect addition to any up and coming holiday meal….give them a try! 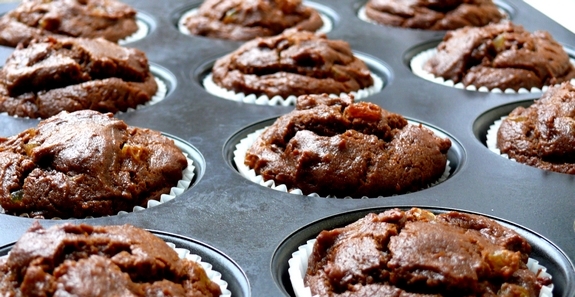 Preheat the oven to 350o F. Line a muffin pan with paper liners. Place the rum and raisins in a small pan, cover and heat until the rum boils. Remove from heat and let them cool. Place the butter and molasses in another pan and bring to a boil over medium heat. Pour the mixture into the bowl of an electric mixture fitted with the paddle attachment. Cool for 10 minutes and mix in sour cream and orange zest. Meanwhile, sift the flour, baking soda, ginger, cinnamon, cloves and salt together into a small bowl. Mix until well combined. With the mixer on low speed, slowly add the flour mixture to the molasses mixture and mix only until smooth. Drain the raisins and add them and the crystallized ginger to the mixture with a spatula. Divide the batter among the muffin pan (1 rounded standard ice cream scoop per cup is the right amount. Bake on the middle rack of the oven for 25 to 30 minutes, or until a toothpick comes out clean. Cool 10 minutes before removing from the pan. Those look really really good. How did I miss the episode of Ian making them? 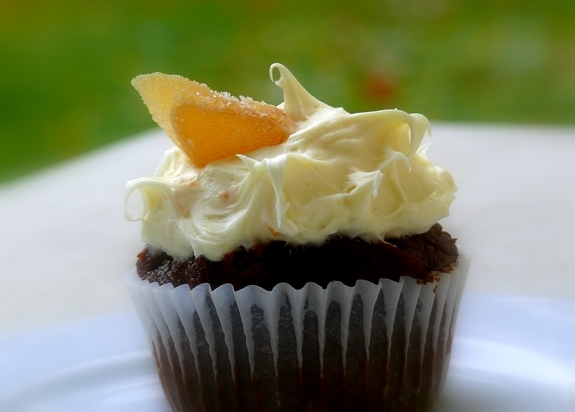 Orange is the perfect complement to gingerbread, isn’t it? One time my friend gave me a plate of gingerbread men that I could share with my family. She put orange zest in them, but I couldn’t identify the flavor. It almost tastes minty or something. I ate the whole plate of cookies before I figured it out. My family never got any. Mmm, love the frosting decor and great flavors. 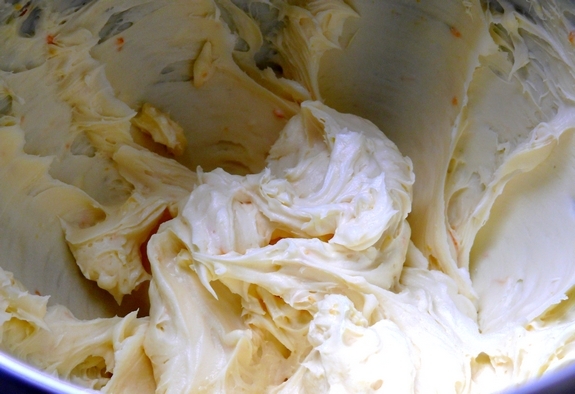 I’ve always used LEMON icing when making gingerbread ANYTHING…d’oh! Orange is perfect! Why didn’t I think of that! These are going on my Christmas brunch menu this year! Love the added flavours of the chrystallized ginger and rim soaked raisins. Gorgeous to say the least! 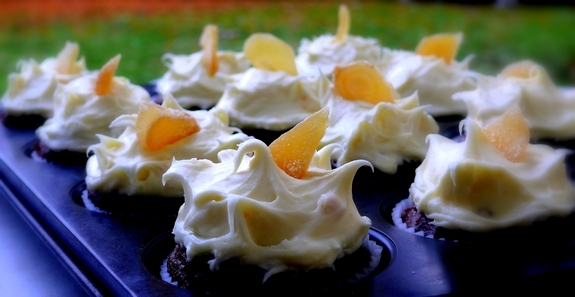 These cupcakes look so refreshing after all that turkey and stuffing! Thanks for this recipe. I will put it on my list for Christmas holidays entertaining. These look simply delicious! I love gingerbread and crystallized ginger. Rum soaked raisins!!! In beer brewing we use ginger and orange all the time. blue moon would be a commercial example. Yes, thank you! 1/4 pound (1 stick) unsalted butter.